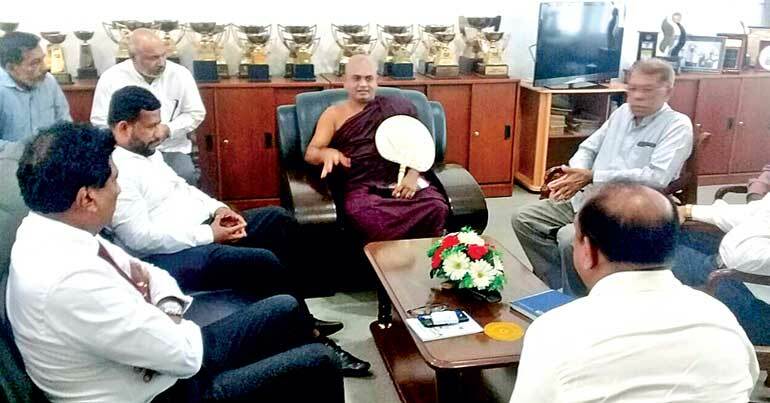 Minister of industry and Commerce Rishad Bathiudeen (seated left middle) meets respected Ven Suhadhagama Seelarathana Nayaka Thero on 28 February at Thero’s Ampara Mandala Maha Viharaya Temple premises, Ampara. 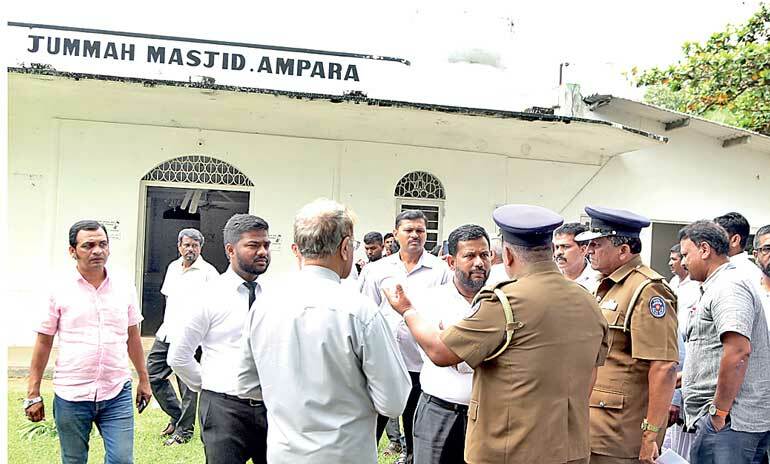 Minister of industry and Commerce Rishad Bathiudeen visits the Ampara Mosque affected by 27 Februrary riots. Ampara is fast returning to normal, the Industry and Commerce Ministry said in a statement yesterday, with efforts being made to establish an inter-religious peace committee to quell community tensions. 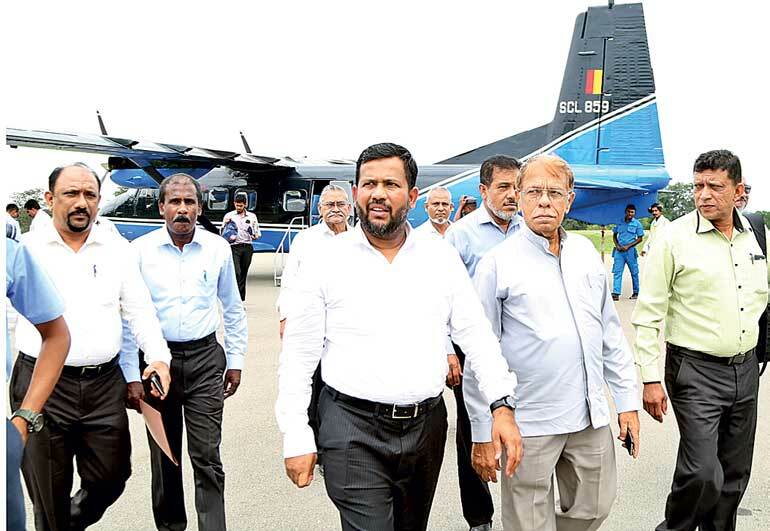 “The suggestion to immediately form an Inter-Religious Peace Committee (IRPC) for Ampara city is a great step to unite the worried people of Ampara,” Industry and Commerce Minister Rishad Bathiudeen said, following a visit to Ampara yesterday (28 February). Bathiudeen was responding to the suggestion by respected monk Ven. Suhadagama Seelarathana Nayaka Thero at Ampara Mandala Maha Viharaya Temple premises, during his meeting with the Ven. Nayaka Thero. Bathiudeen, who flew to Ampara on the morning of 28 February, was joined at this meeting by Ampara District Deputy Inspector General of Police Nuwan Wedasinghe, STF Ampara Zonal Chief Athula Ratnayake, and Ampara District Secretary Thusitha P. Wanigasinghe, among others. Previously, on 27 February, Bathiudeen severely condemned attacks that took place in Ampara city, targeting a mosque and several businesses in Ampara city. During the 27 February Cabinet meeting, he called on the Government to take “immediate and strict action” on the wrongdoers, saying that the Government should compensate for the losses. A mosque, a lodging place adjoining the mosque, several small shops close to the mosque, a street-side hotel, and several vehicles were set alight by a group of men on the early hours of 27 February, after an argument erupted between some men and the owner of a street-side hotel in Ampara town. During his visit to Ampara, Bathiudeen also met affected people in the city and had discussions with them, assuring that the new Committee would come into effect soon to safeguard them.